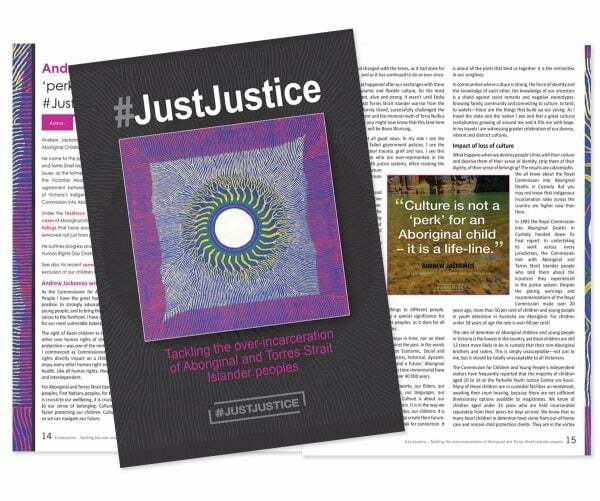 When a Senate inquiry’s report into transvaginal mesh implants was released earlier this year, it privileged the voices of women who had been adversely affected. The overall picture from the inquiry showed “the medical profession in a very poor light”, the Senators reported. 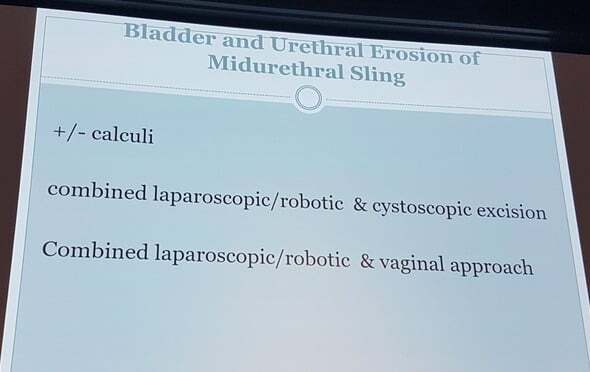 At the Royal Australian and New Zealand College of Obstetricians and Gynaecologists’ Annual Scientific Meeting in Adelaide yesterday, gynaecologists highlighted the damaging impacts of this medical history on the profession itself, as well as upon regulatory authorities. 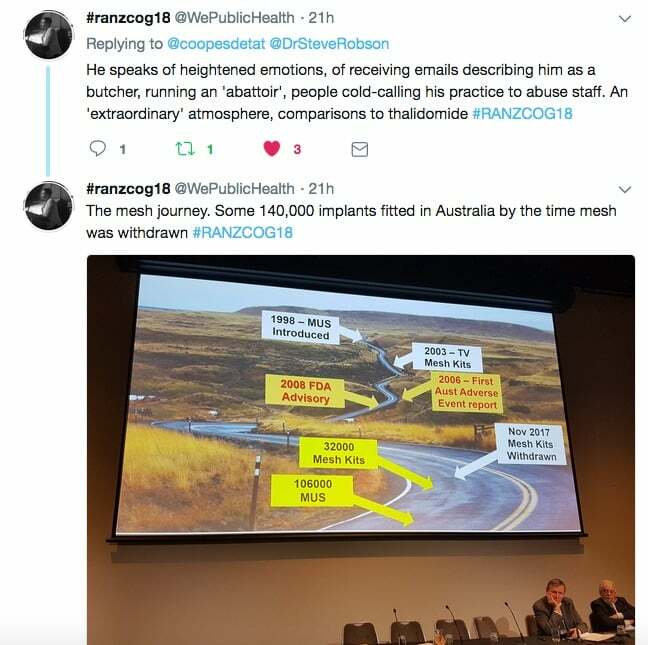 One prominent specialist described his practice being bombarded with phone calls accusing him of being a “butcher”. 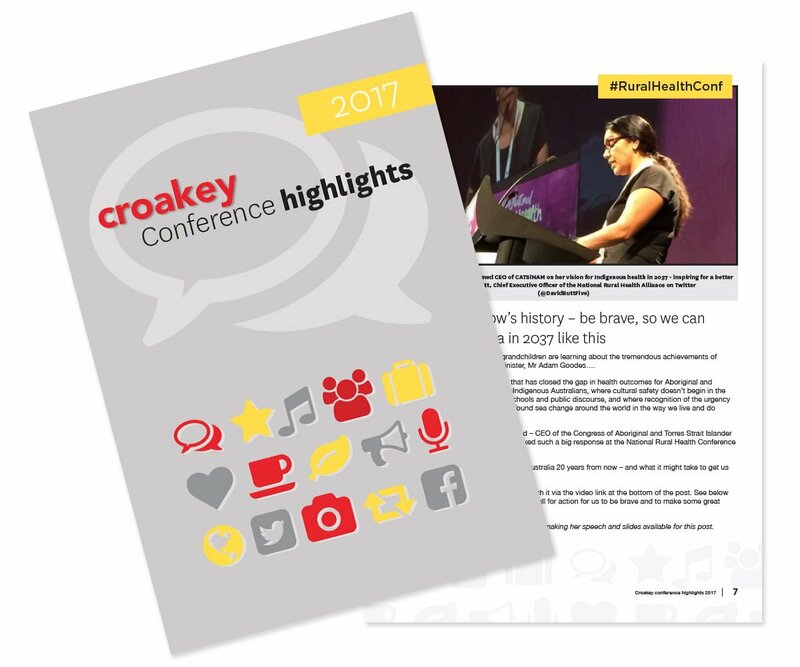 Amy Coopes is covering #ranzcog18 for the Croakey Conference News Service. 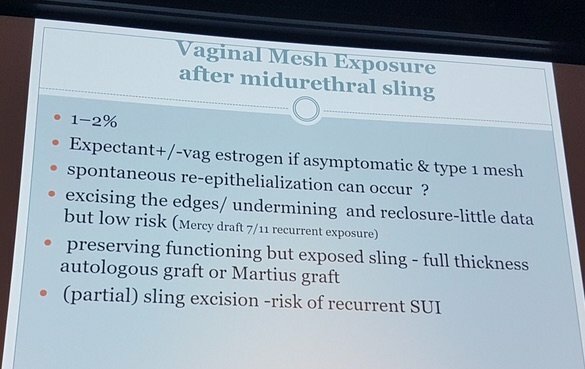 Leading Australian and international gynaecologists have shared their devastation and frustration at the political and regulatory controversy engulfing the profession over the use of synthetic pelvic mesh at a major women’s health summit in Adelaide this week. 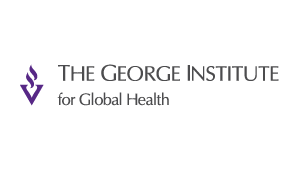 The implants, used to treat urinary incontinence and prolapse in an estimated 140,000 Australian women over the past 20 years, were banned nationally by the Therapeutic Goods Administration in 2017 amid mounting reports of painful, debilitating complications and a series of class actions and inquiries worldwide. 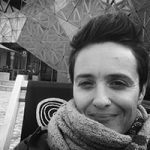 Hundreds of Australian women came forward to a Senate inquiry to share their stories of pain, distress, loss of function, isolation and humiliation from adverse effects ranging from tissue erosion and infection to bleeding and incontinence. 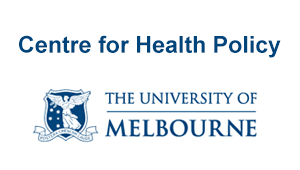 The Senate report, published in April, makes for harrowing reading, and reserves some of its harshest criticism for the “dismissive and disrespectful” treatment meted out by doctors when these women sought to have their concerns addressed. 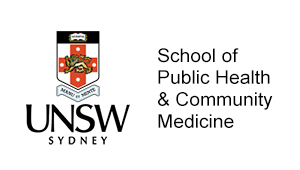 The report highlighted a complex regulatory and oversight landscape in which the specialist colleges, while responsible for training doctors and maintaining best practice guidelines on clinical conditions, have no role in actually credentialing medical professionals or in device regulation. 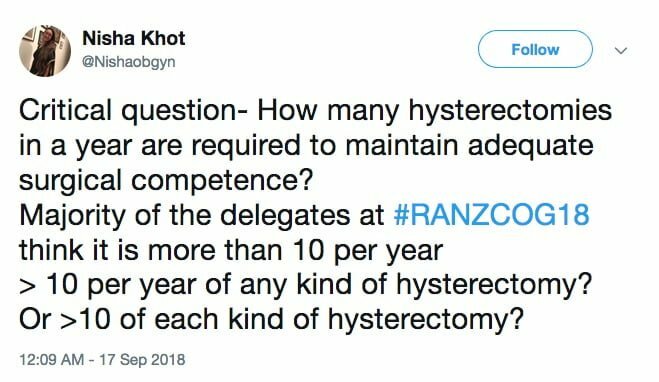 Members of the Royal Australian and New Zealand College of Gynaecologists and Obstetricians – the specialist body overseeing women’s health doctors across the two countries – vented their dismay and frustration at the controversy at their annual summit in Adelaide this week. 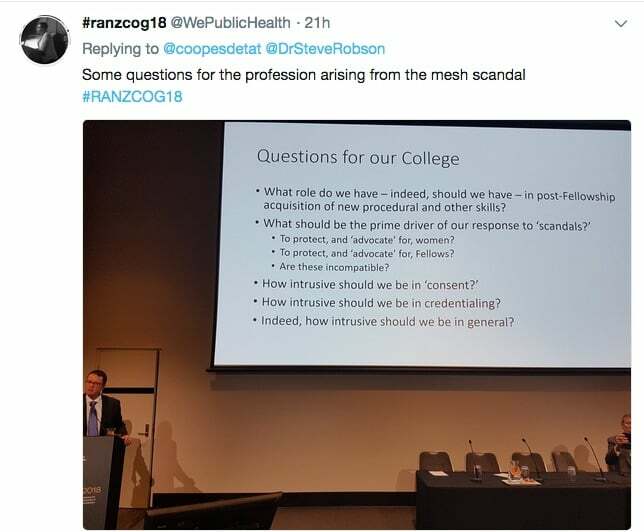 In a session dedicated to pelvic surgery and the use of mesh implants, College President Dr Steve Robson reflected on the immense impact of the events on the profession, destabilising public trust in not only gynaecologists but doctors more generally, and eroding confidence in the TGA. 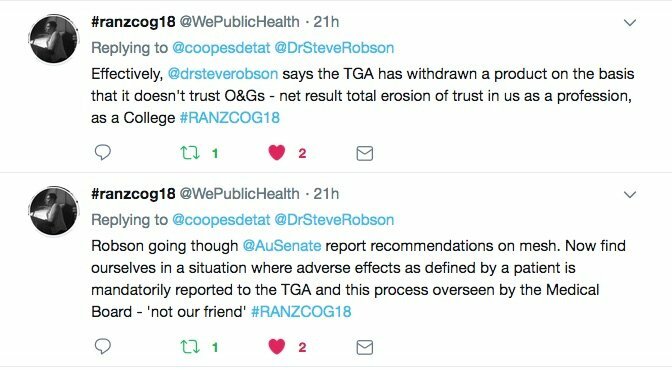 “There was a huge sense in the community that you couldn’t trust O&G specialists or doctors in general, doctors felt they couldn’t trust the regulators, nobody felt that they could trust lawyers, and there was a sense of unease that nobody knew who they could turn to, who they could rely on,” Robson said in an interview following the session. An emotional Robson told colleagues he had not been prepared for the vitriol that followed his public apology to affected women, with hundreds of people contacting him personally and bombarding his practice with phone calls accusing him of being a “butcher” and running an “abattoir”. 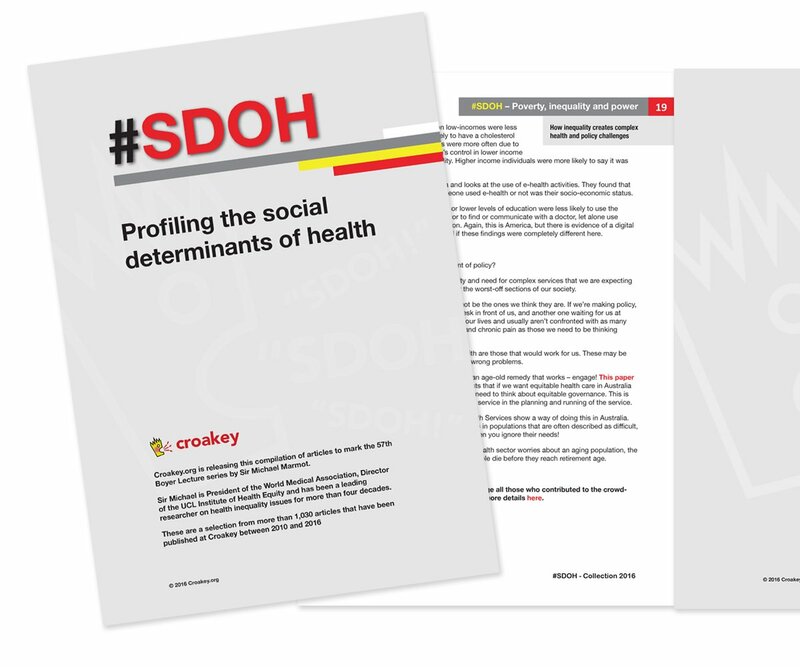 There was an “extraordinary” atmosphere of hostility and high emotions, with media reports drawing comparisons to the thalidomide birth defects scandal. 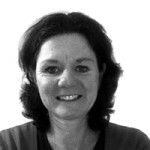 “When you’re in a caring profession your whole ethos is about wanting to help. It’s like a stake through your heart because it gets right at the core of who you are and what you want to do,” he said. 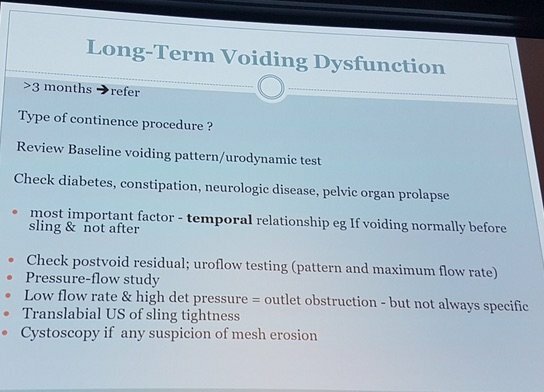 Demand for the surgery had plummeted by about 30 percent due to the publicity, and Brisbane-based urogynaecologist Dr Alex Mowat said it had been a difficult time for trainees, with uncertainty over surgical approaches and inferences of poor training and incompetence from the public. 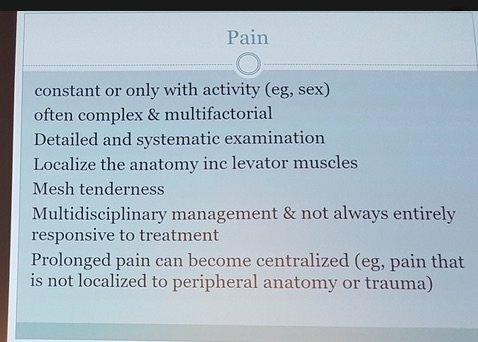 Dr Anna Rosamilia from Monash University presented on management of the most common complications from mesh surgery, of which she said pain was the most intractable. 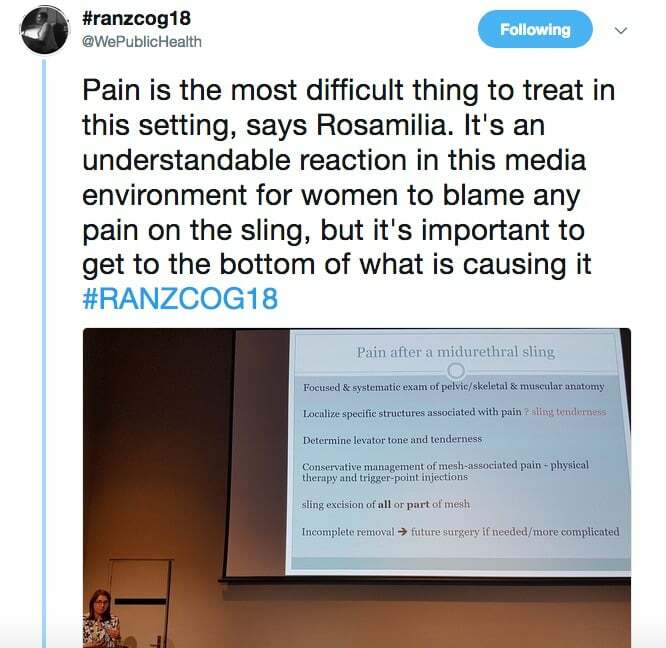 Rosamilia noted that, while it was an “understandable reaction” in the present media climate around mesh to blame it for any pelvic pain, it was important to thoroughly investigate for all potential causes. 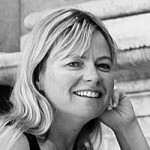 Though the Senate report acknowledged the volume of adverse outcomes involved only a fraction of the total number of women treated, it also found that complications had been significantly under-reported, providing a “false indication of the safety of such devices and contribut(ing) to delays in responding to the issues identified”, resulting in more women being affected. 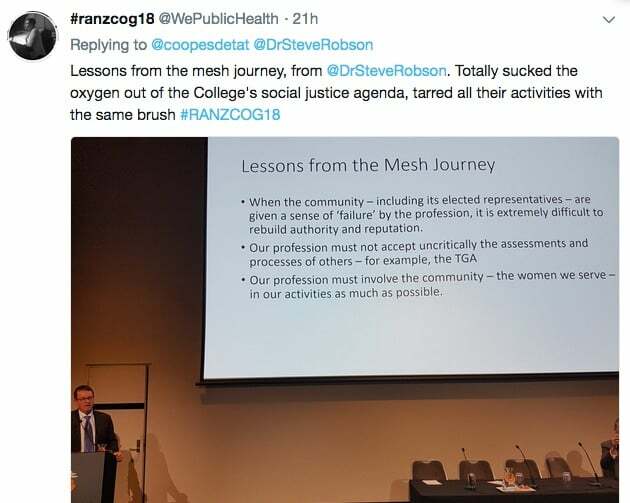 Rosamilia told colleagues that, while there was “no doubt” that mesh caused complications, the weight of evidence and professional opinion continued to support its use. 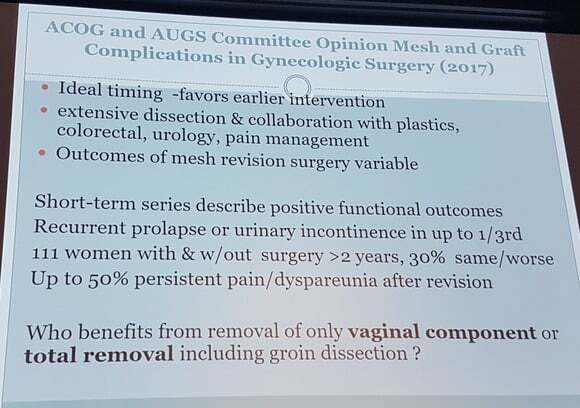 This was echoed by Boston urogynaecologist Dr Peter Rosenblatt, who said mesh remained the go-to for many surgeons in the United States and was still considered the gold standard for recurrent or significant prolapse. “I hope what you have here in Australia is a moratorium not a ban,” said Rosenblatt, describing some of the local reporting he had seen as “salacious”. 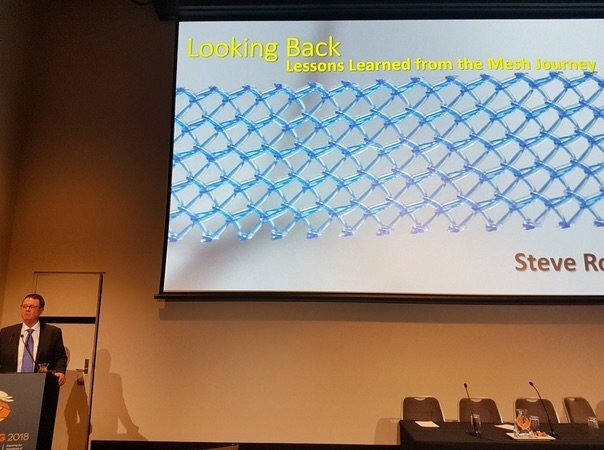 Ditching the use of mesh in favour of a return to the older ways of doing things was “a devolution not and evolution and we shouldn’t be going there,” he added, warning that overzealous regulation of the medical device industry risked stifling innovation. 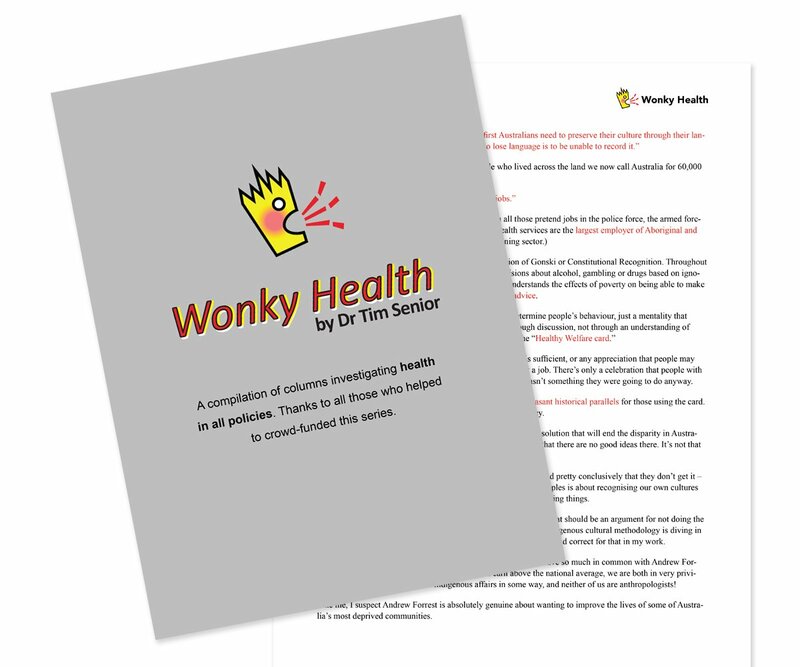 Adelaide-based pelvic floor specialist Dr Ian Tucker shared the example of coronary angiography, which is now the cornerstone of non-invasive cardiology. When the procedure was first rolled out, he said, 50 percent of people died on the table. Had the response been to ban the treatment, the entire field would not have advanced. Robson said the controversy had offered some important lessons for the College, and posed some conundrums (see this Twitter thread). 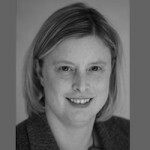 It had highlighted how essential it was to do everything in partnership with rather than at professional remove from the women it served, and illustrated that – once lost – public confidence was very difficult to rebuild. 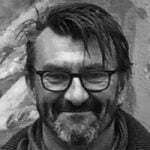 “I think the biggest question for us is how do you possibly get the balance right, where people have enough faith in what you, in your attempts to help them,” said Robson. For the College, it posed some fundamental questions about their core business and priorities, he added. The whole meeting had a chance to consider the issues with a mock trial in the main auditorium on a case involving the use of a mid-urethral sling, resulting in PTSD and inability to work. 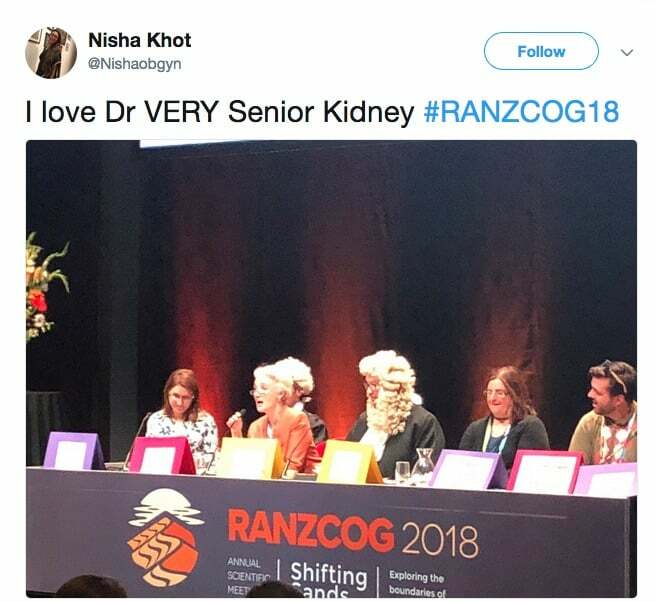 Doctors were asked to cast their votes on the way the case was handled, illustrating divergent opinions on issues with paperwork, supervision, and operating experience. 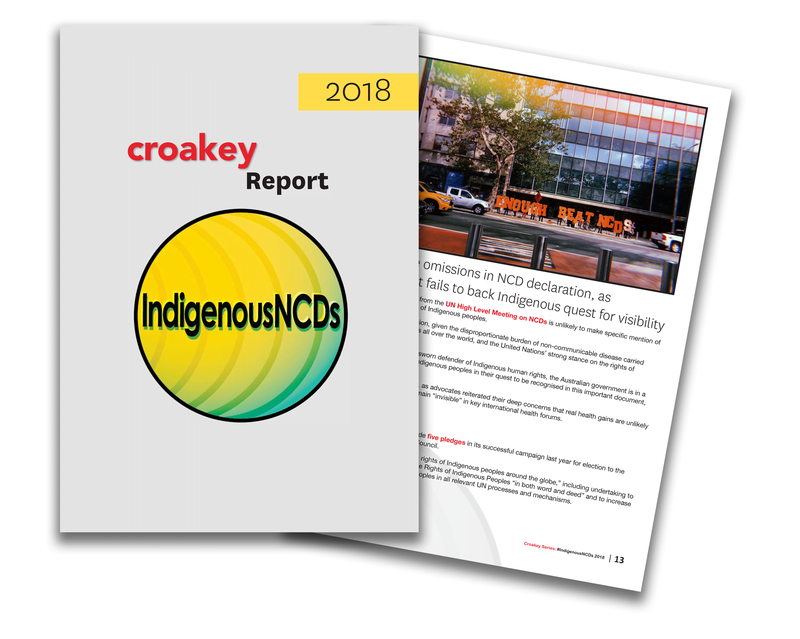 • Amy Coopes is covering #ranzcog18 for the Croakey Conference News Service.